Harry N. Abrams, 9781419729836, 240pp. Paloma Contreras is the blogger behind the popular interior design site La Dolce Vita. She has been featured in many major publications, including Domino, House Beautiful, the New York Times, AD online, Vogue, Elle Decor, and the Wall Street Journal. She lives in Houston. "With stunning photography and accessible-yet-elegant tips, Dream Design Live fuses interior decorating advice with lifestyle recommendations and demonstrates how living a happy and satisfying life starts at home." "Paloma walks the reader through the process of how to create a home that is not only functional and nice to look at but operates as a kind of vision board too." 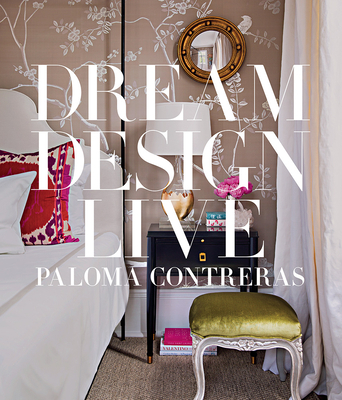 "Creating interiors that are both meaningful and fulfilling are the subject of Paloma Contreras’ Dream Design Live (Abrams). From thinking creatively about your design approach to improving your life, Contreras provides an accessible but beautiful look at the decorating process." Contreras says you can’t design a room without inspiration, and we expect her book will provide loads of it for those looking to feather their nests in her crisp, fresh, unexpected style. "In Dream, Design, Live (Abrams), Contreras, onetime Spanish teacher, successful blogger, and, now, working designer, explores the design process through the lens of travel, inspiration, and personal style. As such, the tome is both an instructional lesson and a personal story, a great read for the design professional and enthusiast alike." "With advice on how to hang curtains, where to place artwork, and how to host a party…Dream Design Live is as much a reference book you will want to dog-ear as it is a sleek tome of gracious living that goes at the top of the coffee table pile."